Includes: One No. 10WWW wood wedge , 1-3/16" W x 1-1/2" H. Two No.3 steel wedges, 1-1/2" W x 1-1/16" H.
High quality rubber head; hardwood handle. 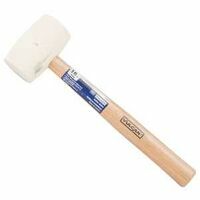 Each handle comes with the required wedges, rivets, or epoxy needed for proper application to the tool head. Quality level codes are: 02- best quality American hickory with a wax finish, 04- better quality American hickory with a wax, 19- better quality American hickory with a clear lacquer finish and 09- promotional grade handles, American hickory.